Author | Editor: Popp, G. (NSI, Inc). Within United States government (USG) and Department of Defense (DoD) spheres, the gray zone is a relatively new terminology and phenomena of focus for characterizing the changing nature of competition, conflict, and warfare between actors in the evolving international system of today. 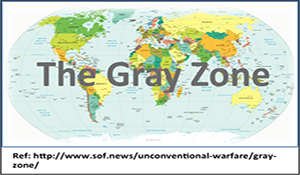 Accordingly, in January 2016, General Joseph Votel (US Army) requested that the Strategic Multi-Layer Assessment (SMA) team conduct a study of the gray zone. The SMA team was asked to assess how the USG can diagnose, identify, and assess indirect strategies, and develop response options against associated types of gray zone challenges. More specifically, the request emphasized that if the USG is to respond effectively to the threats and opportunities presented in the increasingly gray security environment, it requires a much more detailed map of the gray zone than it currently possesses. To properly conduct any effort focused on researching, understanding, and assessing this gray zone space, it is imperative to first ensure that the effort is using sound, appropriate, and comprehensive definitions—to effectively assess the gray zone, one must appropriately define the gray zone. The importance of proper definitions is particularly relevant when it comes to the study of the gray zone, which is an inherently ambiguous concept in itself and has a number of varying definitions already in existence. Recognizing the importance of properly characterizing and defining the gray zone concept, the SMA team put significant effort into developing a sound, comprehensive definition of the gray zone. Through a series of panel discussions and intense inter-team discussions, and with the assistance of a white paper on the topic, the SMA team, in conjunction with USSOCOM, developed the following definitions for the gray zone, gray zone activity, and gray zone threats. The gray zone is a conceptual space between peace and war, occurring when actors purposefully use multiple elements of power to achieve political-security objectives with activities that are ambiguous or cloud attribution and exceed the threshold of ordinary competition, yet fall below the level of large-scale direct military conflict, and threaten US and allied interests by challenging, undermining, or violating international customs, norms, or laws. Gray zone activity is an adversary’s purposeful use of single or multiple elements of power to achieve security objectives by way of activities that are ambiguous or cloud attribution, and exceed the threshold of ordinary competition, yet apparently fall below the level of open warfare. In most cases, once significant, attributable coercive force has been used, the activities are no longer considered to be in the gray zone but have transitioned into the realm of traditional warfare. While gray zone activities may involve non-security domains and elements of national power, they are activities taken by an actor for the purpose of gaining some broadly-defined security advantage over another. Gray zone threats are actions of a state or non-state actor that challenge or violate international customs, norms, and laws for the purpose of pursuing one or more broadly-defined national security interests without provoking direct military response. 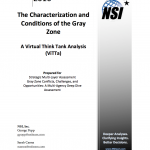 In an effort to validate the SMA team’s definition of the gray zone, NSI applied its Virtual Think Tank (ViTTa) subject matter expert elicitation methodology to the problem set. As part of this ViTTa effort, NSI interviewed leading gray zone experts to better understand the characterization and conditions of the gray zone, putting particular emphasis on having the experts assess the SMA team’s gray zone definition. NSI recorded and transcribed the interviews, which formed the basis of this report. The goal of this report is to present the experts’ insights relating to the characterization and conditions of the gray zone and, in particular, highlight expert feedback, insight, and commentary regarding the SMA team’s gray zone definition.